The Bognor Friday Night Benevolent League divisional singles knockouts – held at Newtown Social Club – drew a relatively small turnout of 49 players across three divisions. 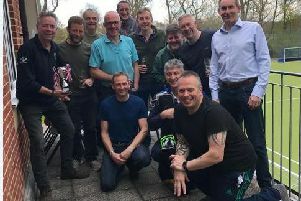 Division three’s contest drew only three players, so a round-robin knockout was played between Ashley Clements, Ian Dendy and Dave Coupland, all from the Royal Oak. Clements beat Coupland 2-0. Coupland then lost 2-0 to Dendy, so Clements and Dendy went straight for the best-of-five legs final instead. Clements won the bullseye to go first, but Dendy hit treble 20, single six and double top for the first leg. The second leg saw Clements have a shot at double top which he took with his first dart. Leg three was close but taken by Clements while Dendy got back on level terms in the fourth. The last leg saw Clements hit double eight to finish it off, taking the match 3-2 and the division-three title. In division two, 21 players took part. The first round saw a 180 from Andy Cooper (Claremont), who lost in the quarter-finals. In the first semi-final Adam Hall (Aldingbourne Mavericks) beat Mark Wingate (Newtown Clubbers). The second involved Nick Tabberer (Pagham CC ‘B’) beating Adam Judd (Mavericks). The division-two final saw Hall win the bullseye and get off to a great start with 140 and 100. In only 20 darts the first leg was his. Leg two started with a 180 from Tabberer, but Hall took advantage of Tabberer’s missed doubles, and for the second leg on the trot took his double in 20 darts. The third leg brough a slow start for Hall while Tabberer started with 105. Both players hit a ton and eventually Hall hit double four to take the match 3-0 and the division-two title. Division one had a field of 25 and there were 180s from Dave Juniper (Lamb Flamingos) and Luke Forden (Pagham CC ‘A’) but went out. Forden hit the highest out-shot of the night with 144 in the second round. The first semi-final saw Dave Owens (Friary ‘Z’) beat Sam Abrehart (Pagham CC ‘A’). In the second Richard Ragless (Friary ‘Z’) defeated Andy Stubbs (Hunston Hares). The final saw Ragless win the bullseye and start with a ton. After hitting 85, 137 and 82, Ragless hit the double for the first leg. Owens started the second leg with a ton and followed it with 121, but Ragless hit two tons to keep close. Owens missed chances at the double to give Ragless another shot which he took. An ailing Owens was trying too hard. Ragless started leg three with a ton, then 60, 140, 94 and 67. Then with 40 left he hit the double, taking the leg, the match 3-0 and the division-one singles title.